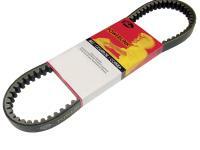 Gates Premium Power Link Drive Belt size 906 X 22 X 30 for 250cc, 4-stroke engines. Specifically designed for a variety of motorized CVT applications. This belt is suitable for: Honda NSS250 Reflex 2001-2003, 2006-2007 and Honda Reflex Sport 2007 Linhai 260, Diamo 150GS-E09.07, CF125/150 E-Charm, Torpedo 150- 250, Sunright VOG 260, Linhai Aeolus 260, Xingyue ita 150cc,OE Belt 05028-3915, Diamo Turista Scooter 300cc, Roketa 260.